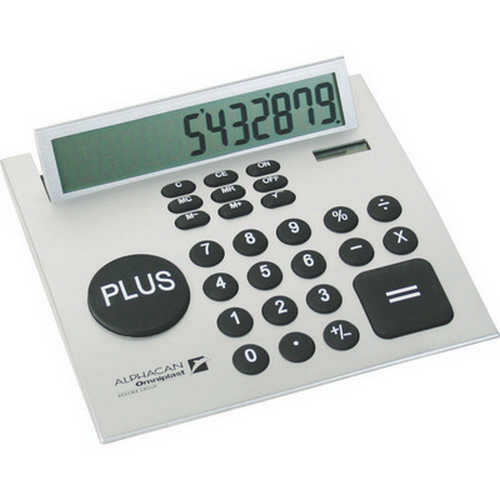 Large desk top calculator. 12 digit display. Unique large Plus & Equals key. Large rubber keys. Adjustable display. Large brading area. Boxed. Product Size: 168 x 165 x 14mm. Product Packing: Boxed. Decoration Size: 30 x 30mm. Decoration Position: Front. Decoration Method: Pad Print. Carton Quantities: 50. Carton Size: 63 x 36 x 20. Carton Weight: 12. Colour: Silver. Price includes : Pad Print 1 Colour / 1 Position. Setup is included.